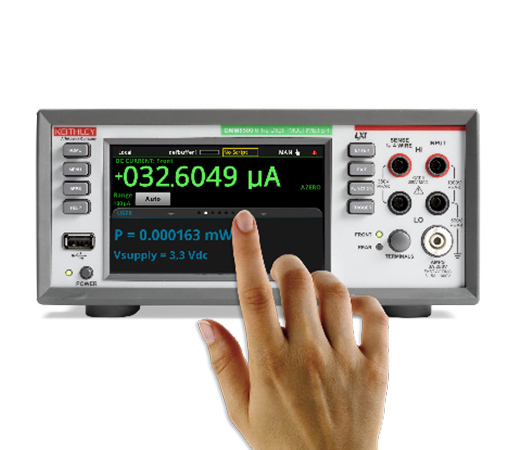 Keithley’s new DMM6500 6½-Digit Touchscreen Bench/System Digital Multimeter offers more measurement capability – including transient capture, data visualization, and analysis – at a price you’d expect to pay for a much lesser performing 6½-digit DMM. The DMM6500 is a modern bench/system DMM delivering more measurement functionality, best-in-class measurement insight, and a price that will not break your budget. The most recognizable feature of the DMM6500 is the large 5-inch (12.7 cm) capacitive touch screen display that makes it easy to observe, interact with, and explore measurements with “pinch and zoom” simplicity. Beyond its display technology, the DMM 6500 superior analog measurement performance delivers 25 PPM basic DCV accuracy for one year and 30 PPM for two years, potentially allowing you to extend your calibration cycles. The DMM6500 is equipped with all the measurement functions you would expect in a bench multimeter, so there’s no need to buy additional measurement capabilities. Its 15 measurement functions, including capacitance, temperature (RTD, thermistor, and thermocouple), diode test with variable current sources, and up to 1 MS/sec digitizing are now included.